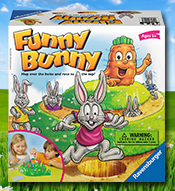 Now until March 31st, you can head on over here to apply to be a Ravensburger Funny Bunny Game Tester! This game is new and is aimed towards 2-4 players ages 5+! If they choose you, they will ship the game to you FREE of charge, in order for you to test it! Good luck!